When the news of new jet class rules for Reno '07 began circulating, some wondered, what, exactly, would become of the sometimes maligned "Hoover" class. 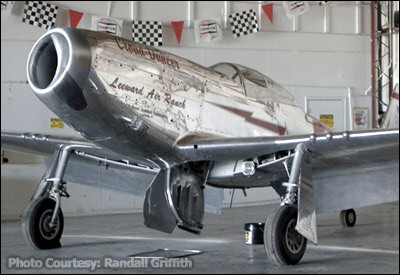 Not having a lot information about the new rules, when we were presented with this "spy photo" taken at Stead last month, we were at first surprised, then dismayed at what could be yet another case of a perfectly good Mustang "chopped up" to make an air racer! "The new rules permit straight wing jets to compete. No afterburners!!!" said Reno Air Race Association CEO Mike Houghton of the new rules... When shown the photo which sparked this story, Houghton smiled and said "some modifications are expected to a few aircraft so they can pass the tech inspection and meet the criteria." Phew! We've been trying for two days to obtain a comment from Florida racer, Jimmy Leeward, the only response we've received at time of publication was a terse "well, I sure missed that MiG"..
Talk about thinking out of the box! It's been a long while since such innovation has been seen at "Reno"... with Jimmy's long awaited debut of the newly re-minted "Galloping Ghost" the addition of his new jet class racer should make Reno 2007 yet another year that we can safely say, "This is going to be the best Reno yet!"